Playing catch up today! 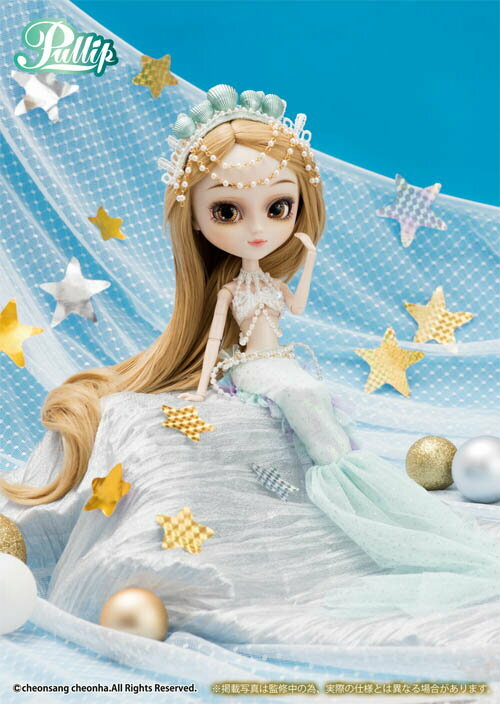 I just posted about Pullip The Secret Garden of White Witch so now it’s time to post about the other Pullip being released alongside of her in December in Japan (one month later here in the US) Pullip Alrescha Pisces. 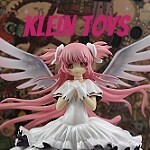 Pullip Alresha Pisces has a MSRP of 19000 yen which is about $167 as of this writing. Arlesha Pisces has a mermaid theme, which while not a totally new concept for Groove is something we have not seen in quite a while from them and not something we have really executed quite so well. 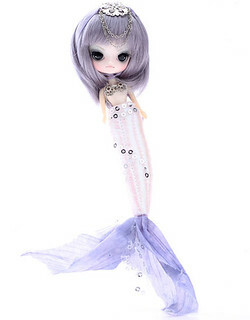 Mermaids in general are an incredibly popular fantasy theme for dolls, while I do find myself wishing that the designers would have veered a bit more into the fantasy territory and given her a fantasy colored wig as well (I intend to give mine a Purple Ocean wig by Luts) I feel like she is a well put together and thoughtfully put together release. 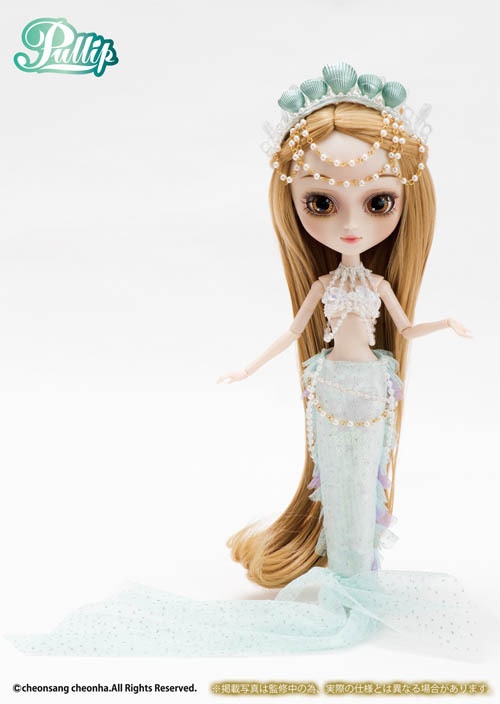 I mentioned previously that mermaids were not totally new ground for Pullip, some newer fans of Pullip may not be familiar with the Pullip release Jaldet who was released in February of 2011, she had much more of a darker almost sea witch theme especially when compared to Arlesha. While I loved her dark and dramatic face up with her assymetrical eyebrows fans overall opinions were a bit divided mostly because of the audaciousness of her fanned tail and top hat! A Little Dal+ Pisces was released as a part of the zodiac little series, she seems to be closer in theme to Arlesha especially since they were both inspired by the symbol for Pisces so I am definitely regretting not having bought her when she was still commonly available as I am sure the pair would have been adorable together in photos. 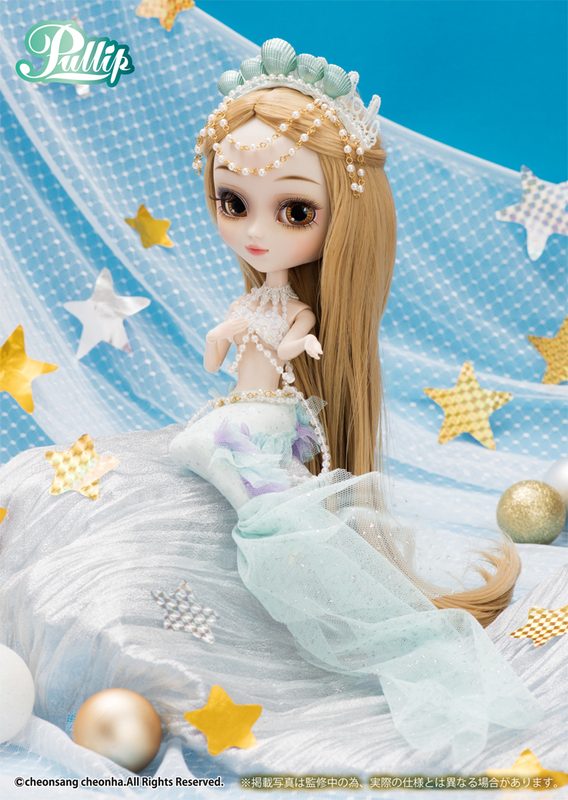 Alresha has a shell headdress with pearls accenting it, I feel like this fits her theme of a mermaid really well. The material her tail is made out of almost makes it look like it has somewhat of an ethereal quality to it which lends nicely to the fantasy theme (though that material would be problematic to try and swim around in). 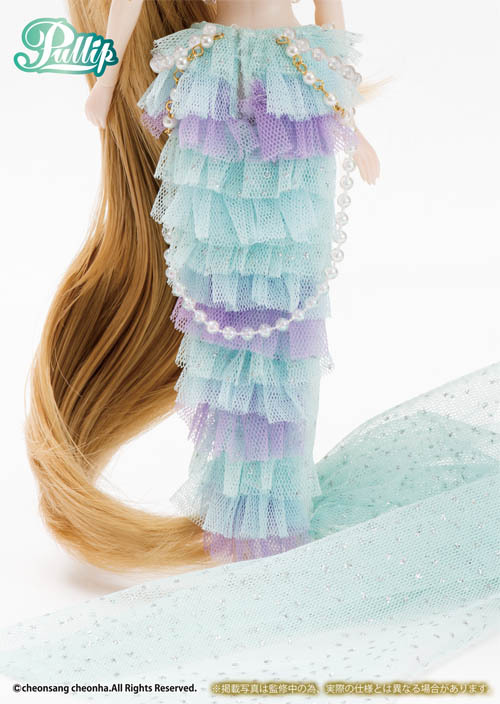 I kind of wish that they had used gold colored string for all of the beaded strands of pearls, I can understand not using the gold colored chains for all of it but I feel like her lower half seems to lack contrast a bit and it would have been a nice finishing touch on her. I love her brilliant foiled gold eye chips the blue spots provides a nice pop of color and really stands out in contrast to the gold. 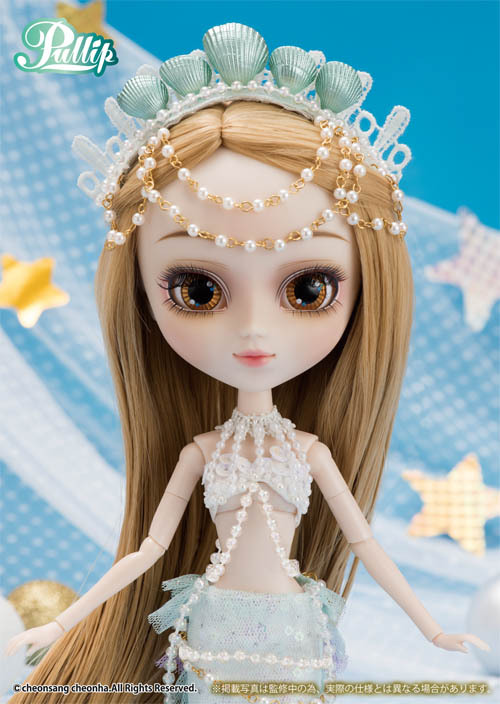 Overall her makeup is very natural and I think it’s neutral enough that Alresha could be redressed/restyled in a lot of different ways if you weren’t so keen on adding a mermaid to your collection, if rechipped I think she would make a lovely mori girl. THE RUFFLES! While they are gorgeous I wonder about the practicality of trying to swim around with such a tail. Will you answer her siren’s call or will you toss her back out to sea? 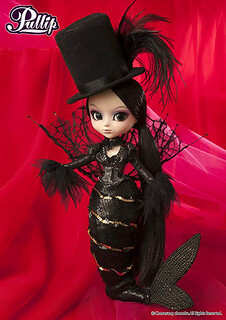 Pullipstyle has said that they will be opening preorders for her later this week, she is currently available for preorder via Pullip.net . I think I am going to have to bait my hook to catch this cutie! 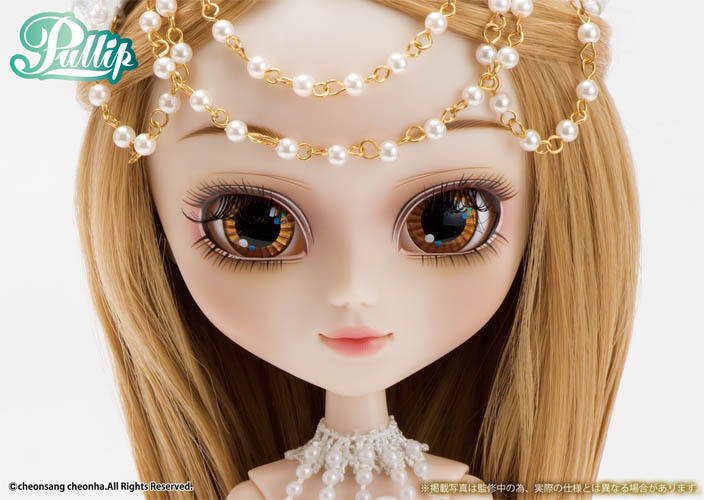 This entry was posted in Doll, Pullip and tagged 2019 pullip, Alrescha Pisces, asian fashion doll, fashion doll, groove, Pullip. Bookmark the permalink.